Accidental fires were common in 17th-century London. Open fires burned in houses, shops and workshops. Timber/wood was the most common building material, and straw was laid on floors and stored in stables. The authorities were aware of the danger. Building regulations were tightened, and in 1664, the king, Charles II urged London's Lord Mayor to enforce them 'to preserve that great and prosperous City from Fire'. However, in 1666, London was less prosperous than it had been, as it was still struggling to recover from the ravages of the previous year's Great Plague. In the early hours of the morning of Sunday, September 2nd 1666, fire broke out – in the king's own bakery in Pudding Lane in the City. Pudding Lane was a narrow street of timbered buildings and shelters, many of them housing cook shops. It backed on to Fish Street Hill, which led to London Bridge, itself lined with buildings made of plaster and wood. Once fire took hold in Thomas Farryner's bakery kitchen that night, it spread quickly. Fanned by a strong east wind, the fire burned fiercely, spreading to buildings in Thames Street in the south, St Botolph's Lane in the east and Fish Street Hill. Many of the buildings were in fact storerooms full of combustible materials such as oil, pitch, hemp and tar. These fuelled the fire, and the heat was so intense that no one could get close enough to fight the flames. at that time, there was no central fire brigade. Local people themselves had to deal with blazes. Where fires threatened to spread, people used axes, ropes and iron fire hooks to drag down wood-frame buildings and create firebreaks. But this fire was already burning out of control. By Sunday morning, 300 buildings were in ashes, the fire had raged down to the river. Even where buildings were pulled down, the heat of the fire was now so intense that it could 'jump' over firebreaks and ignite timbers on the far side. The fire raged for four nights and days. On Monday, the southern half of the City burned and King Charles, fearful of public disorder, gave control of the metropolis to his brother, the duke of York, who set guards to control looting. Londoners left their homes in a mass exodus, carrying what possessions they could away from the advancing fire. The price of a cart rose from £3 to £30; all the river boats were already packed with refugees and their belongings. People with valuables buried them or hid them in sewers before fleeing. Those who left by road went to the high ground of Moorfields, Islington and Parliament Hill, where they camped and watched the City burn. On Tuesday, the fire burned westward and northward and, after midnight, consumed two great buildings, the Guildhall and Old St Paul's cathedral. 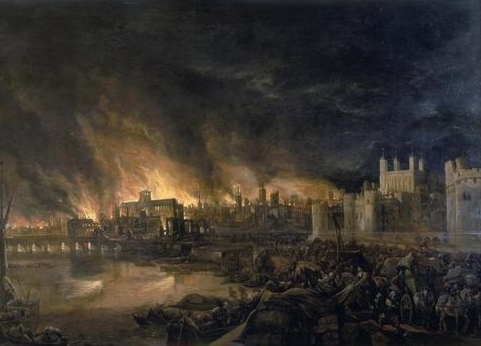 The fire was checked in the east by gunpowder explosions, which created large firebreaks and saved the Tower of London. But in the west, the fire leapt the river Fleet and now threatened to spread to Whitehall and the royal palaces. At last, on Wednesday morning, the wind dropped and the fire lost intensity and broke up. It became possible to douse the flames, but people battled for another 36 hours before the last of the fires were finally extinguished on Thursday night. More than 13,000 houses, 87 churches and the main buildings in the City had all been destroyed. Amazingly, only five deaths were documented, but up to 200,000 people were left destitute. The cost of accommodation soared, and a fire court was set up to judge disputes over who owned which property. 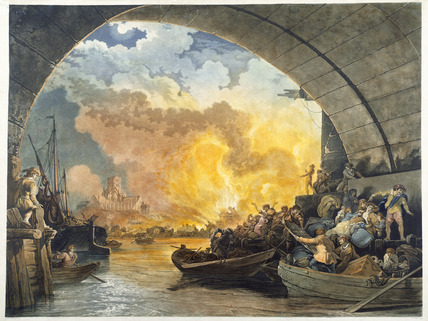 The Great Fire had left Londoners with a great task – rebuilding their city. "Si Monumentum Requiris Circumspice". "If you seek his monument, look round". Christopher Wren also rebuilt 52 of the City churches, and his work almost turned the City of London into the city we know today. Some buildings did survive the conflagration, but only a handful can still be seen today.